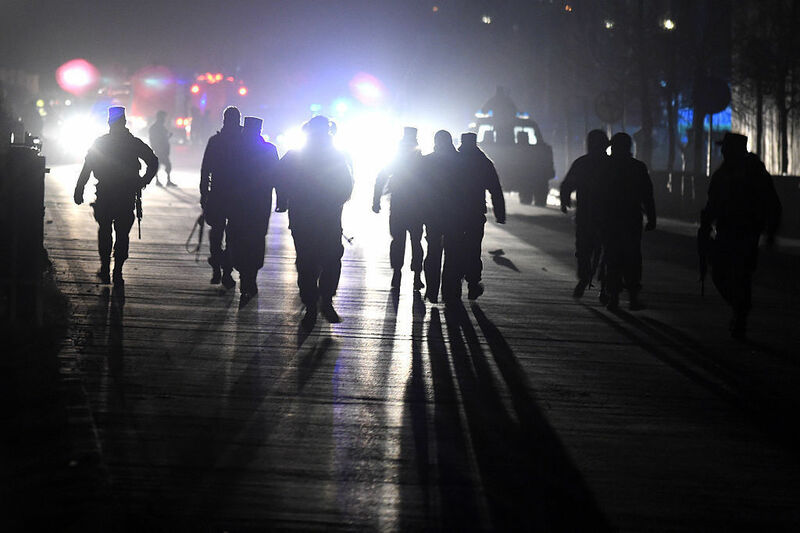 Twin Blasts Kill Dozens In Kabul, Afghanistan : The Two-Way The explosions near the parliament building in Kabul killed at least 30 people and injured at least 70. Bombings in two other provinces Tuesday also caused multiple casualties. Afghan security personnel arrive at the site of two bombs on Tuesday near the Afghan parliament in Kabul. Two bomb blasts near the parliament building in Afghanistan's capital, Kabul, have killed at least 30 people and injured at least 70. "The first bomb exploded near a parked minibus," NPR's Nishant Dahiya reported. "The second, when the police arrived to help the victims." It happened during the evening rush hour as parliament staff were leaving work. A female lawmaker was said to be among the injured, Nishant added, and other parliament staff were also reportedly victims of the attack. The Taliban has claimed responsibility for the bombings. "We planned this attack for quite some time and the plan was [to] target some senior officers of the intelligence agency. We sent one suicide bomber to target a mini bus that was carrying these officers," Taliban spokesman Zabihullah Mujahid said, according to Reuters. "We did exactly what we planned." It happened during a period of relative calm in Kabul, Nishant said. This appears to be the deadliest attack in the capital since July, when at least 80 people were killed during a protest march of the minority Hazara community. That attack was claimed by the Islamic State group. There were at least two other bombings today in other parts of Afghanistan. In the southern province of Kandahar, a blast killed five people, according to the Associated Press. It happened at the provincial governor's guest house, injuring the United Arab Emirates' ambassador to Afghanistan and "a number of Emirati diplomats who were accompanying him," according to a statement from the UAE Foreign Ministry. The ambassador was on a "humanitarian mission" to Kandahar, the Foreign Ministry added. Another bombing, in the capital of Helmand province, killed at least seven people, according to the BBC. President Ashraf Ghani vowed to bring the perpetrators to justice, the broadcaster reported. "The Taliban shamelessly claim credit for the attack on civilians and they're proud of it," Ghani said in a statement.